ECIS - European Conference on Information Systems 2019 invites interested organizations and companies to sponsor this renowned annual scientific event. ECIS brings together researchers and practitioners who are active in a wide range of information systems related areas. This year's theme is "Information Systems for a Sharing Society" and will take place in Stockholm and Uppsala, Sweden. We anticipate between 500 to 800 research participants and particpants of the Industry Day, as well as 200 to 300 scientific presentations. It is a great opportunity to acquire exposure and reach potential partners from Europe and the world. Please become the sponsors of ECIS2019 and get benefits from this opportunity. We look forward to seeing you at ECIS2019 in Sweden! For information regarding sponser contracts, benefit fulfillment, registration or exhibit logistics, please contact: ecis2019@dsv.su.se. 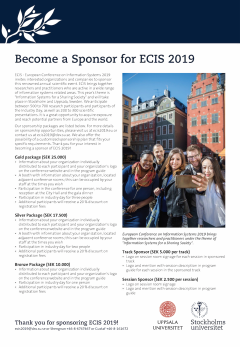 Download our sponsorship letter Become a sponsor for ECIS 2019 (8071 Kb) .